Sarah is certified by the American Nurses Credentialing Center and is a member of the American Association of Endocrine Surgeons. She specializes in endocrine surgery and surgical treatment of the thyroid, parathyroid and adrenal glands. Sarah is also dedicated to the treatment of benign and malignant diseases of the thyroid such as thyroid cancer, Graves disease, hyperthyroidism, thyroid nodules and goiter, and works closely with our endocrinologists in our multidisciplinary thyroid clinic. 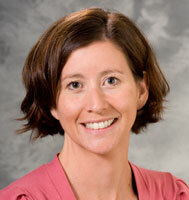 Sarah conducts clinical research working on improving the care and outcomes of patients with endocrine tumors.